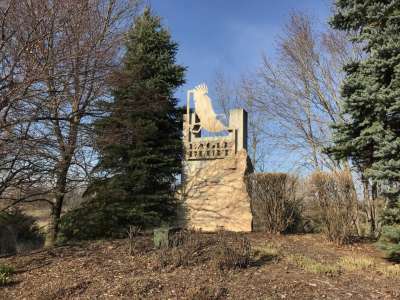 Eagle Bluff is located on the southeast side of Hudson, WI with rolling hills, mature trees and commanding views of the St. Croix River Valley from its elevated position. Featuring overlook vantage points…arguably the best views in the Hudson area, with panoramic sight-lines all the way to Minnesota from Bayport to Afton Alps. Residents in Eagle Bluff enjoy the quiet rural feel…..while Its close proximity to Highway 35 makes this neighborhood feel close to all that Hudson, WI has to offer, its wooded acres make you feel at home in the country. Eagle Trail circles the park and has rustic benches for “rest stops.” The trail system was expanded in 2006 into the wooded buffs of the western and northwestern sections of the park, adding more than 1.5 miles. Hikers can now enjoy “Summit Loop,” that has a natural overlook at the highest point, located in the northwest corner of the park. Outdoor enthusiasts can find a natural habitat diverse with native trees, woodland flowers, ferns, wild berries, and wildlife along the marked trail system.